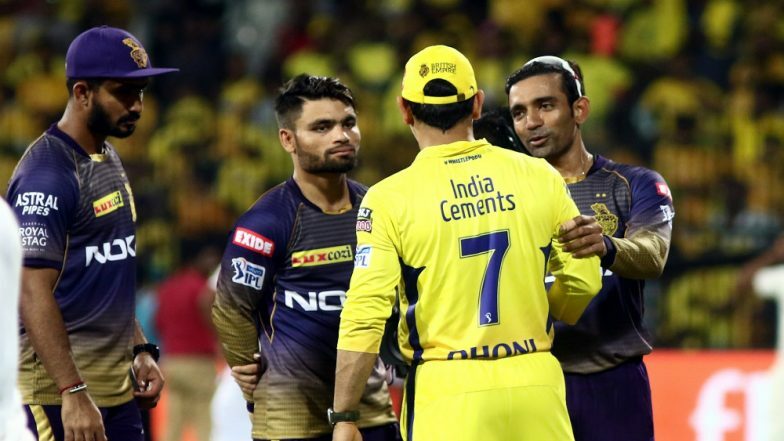 Chennai, April 10: All-round Chennai Super Kings made short work of Kolkata Knight Riders (KKR), thrashing them by seven wickets in a lopsided Indian Premier League (IPL) encounter here on Tuesday. The victory saw the defending champions replace KKR at the top of the eight-team points table with 10 points from six matches. KKR, meanwhile, dropped down to second spot, having eight points from six outings. CSK beat KKR by 7 wickets | Kolkata Knight Riders vs Chennai Super Kings Live Cricket Score 23th T20 Match. Deepak Chahar (3/20) scalped three wickets and was well supported by veteran spinners Harbhajan Singh (2/15) and Imran Tahir (2/21). IPL 2019 Points Table Updated: Chennai Super Kings Back on Number One of the Indian Premier League 12 Team Standings Following Win Over KKR.